About BBC Question Time,from 11th January 2018. The cut is around 19 mins 40 seconds. I was given the great opportunity to join the Question Time audience and have my say on issues that are at stake for me as well, in the diverse Islington in London. I am a PhD Student in London, a Cambridge graduate, and an EU migrant. Some would say I am more of an ‘expert’ on migration than most of your guests who speak about, without speaking to, EU migrants in this country. Mr Dimbleby was very nice and offered me the chance to voice my opinion at the end of the first broadcasted question, just before he went to announce where Question Time will be next week. I openly criticised the lie that Mr Raab, one of the panelists, deliberately propagated to silence opposition voices on the issue of citizen rights. He said the deal on EU migrants’ rights and expats is done and dusted. I commented that it is not, because nothing is agreed until everything is agreed. I also added that the current settled status that the Government proudly disseminates with all sorts of infographics on all channels possible is, in fact, not in line with Vote Leave’s promise on 1 June 2016 of ‘automatic guarantees for EU citizens’. Settled status is not automatic as one has to apply and pay for. 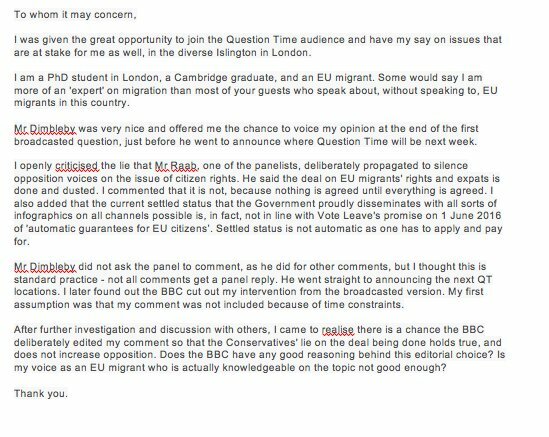 Mr Dimbleby did not ask the panel to comment, as he did for other comments, but I thought this is standard practice – not all comments get a panel reply. He went straight to announcing the next QT locations. I later found out the BBC cut out my intervention from the broadcasted version. My first assumption was that my comment was not included because of time constraints. After further investigation and discussion with others, I came to realise there is a chance the BBC deliberately edited my comment so that the Conservatives’ lie on the deal being done holds true and does not increase opposition. Does the BBC have any good reasoning behind this editorial choice? Is my voice as an EU migrant who is actually knowledgeable on the topic not good enough? Major improvements to the M3 junction 9 to allow free movement between the A34 and M3. The Commission, as European Union negotiator, will ensure a maximum level of transparency during the whole negotiating process. Commission negotiating documents which are shared with EU Member States, the European Council, the European Parliament, the Council, national parliaments, and the United Kingdom will be released to the public. This transparency policy will be regularly reviewed to ensure that it fulfils its objective and does not negatively impact the integrity of the negotiations. In implementing this policy, the Union negotiator will act within the limits of EU law and respect the Commission’s legal obligations with regard to protection of information as defined in art 4, paragraph 1 of Regulation n° 1049/2001 of the European Parliament and of the Council of 30 May 2001 regarding public access to European parliament, Council and Commission documents. Most constituencies can only be realistically contested by two parties. This site shows which way you should vote on 8th June to prevent the Tories from getting into power again. European Council (Art. 50) guidelines following the United Kingdom’s notification under Article 50 TEU.